Few things say “comfort” like a plate piled high with macaroni and cheese. And I don’t mean the boxed kind. I mean plump noodles drenched in a rich and creamy homemade cheese sauce. That’s the kind! 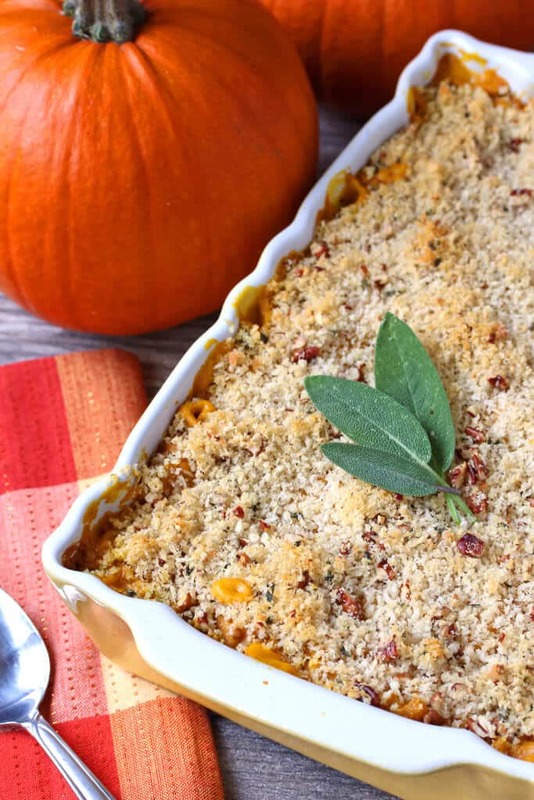 Well, ’tis the season to be pumpkin and so I’ve conjured up a truly delectable Autumn-themed mac and cheese the whole family will love! Speaking of pumpkins, this year saw our very first pumpkin harvest. We planted 5 pumpkin starts and boy what a harvest it was! It’s the first year all of our carved Halloween pumpkins came right from our own garden which was really cool. We still have a ton of pumpkins left including the smaller, more flavorful sugar pumpkins and I’ve been baking and cooking up a storm of pumpkin-based dishes. 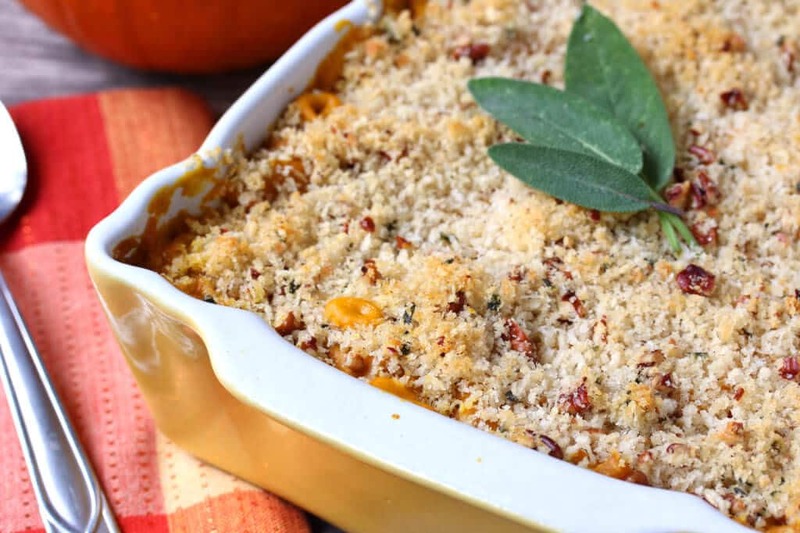 This Pumpkin Mac and Cheese with Sage and Gorgonzola is one example. 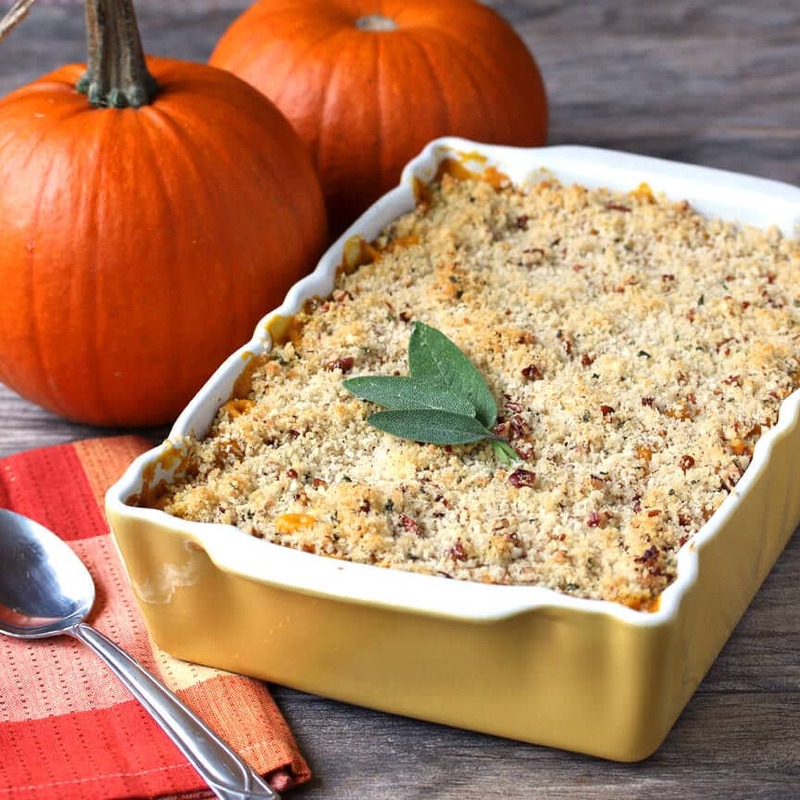 The sauce is pumpkin-based with aged cheddar and gorgonzola and seasoned with fresh sage, then topped with a crunchy Parmesan-pecan breadcrumb topping. Yes, even our 3 and 5 year olds devoured this stuff. And…they never guessed there was nearly two pounds of nutrition-packed pumpkin in it. SCORE! 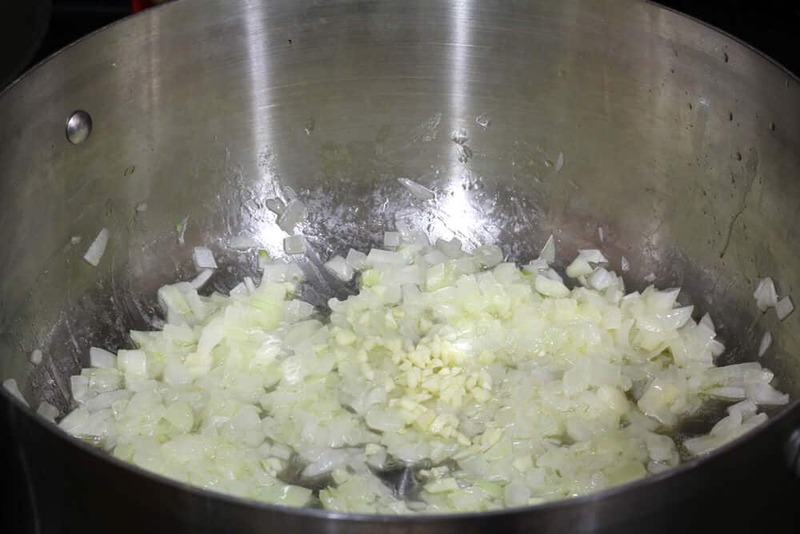 Melt the butter over medium-high heat in a large stock pot (large because we’re stirring in the noodles later) and cook the onions until soft and translucent, 5-7 minutes. Add the garlic and cook for another minute. Stir in the flour and cook for 2 minutes, stirring regularly. 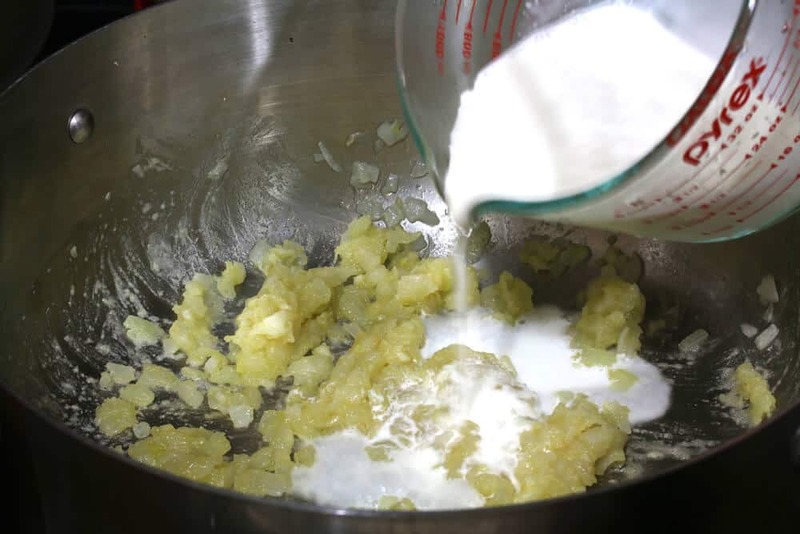 Pour in the milk, stirring continually until the flour is dissolved. Simmer until the the mixture is thickened. 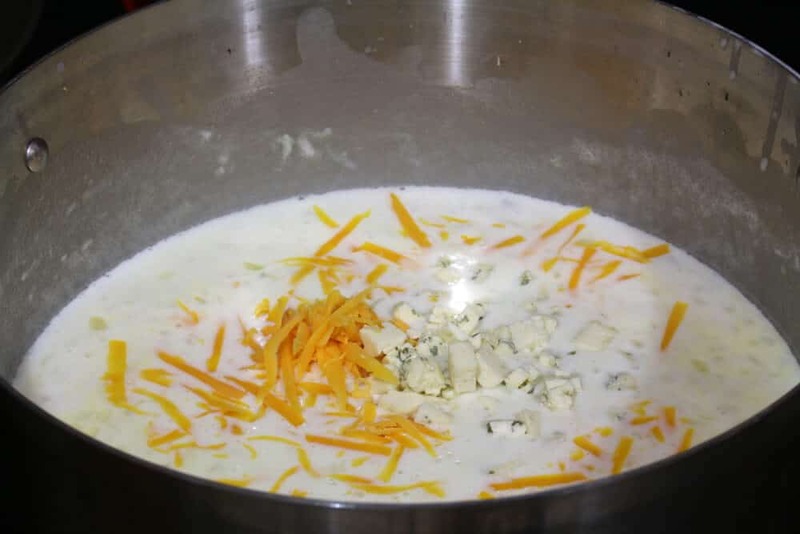 Add the cheddar cheese and gorgonzola and simmer, stirring frequently, until melted. Add all remaining ingredients except for the noodles and stir to combine. 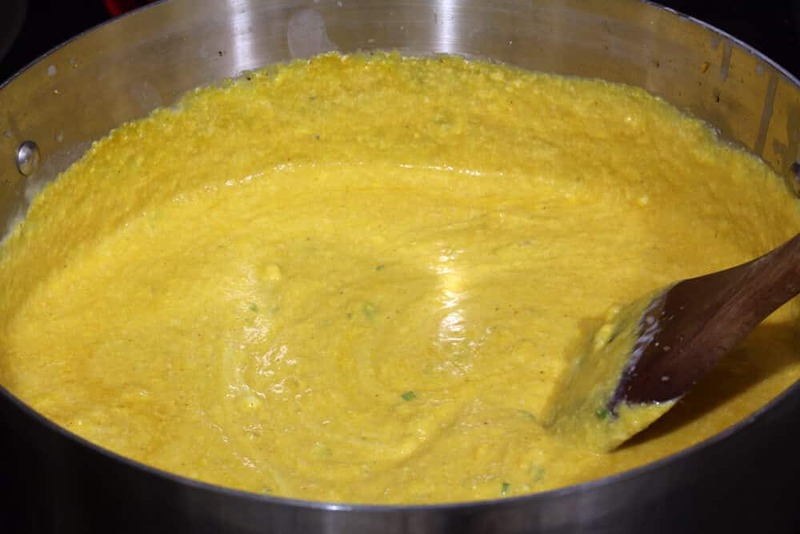 Let the mixture simmer for 3-4 minutes. Add salt and pepper to taste. Stir in the noodles. I used whole wheat macaroni. Butter a deep-dish 9×13 baking dish and pour in the pasta mixture. You can also use a regular 9×13 baking dish and make a few extra individual servings in ramekins or only make individual servings. Prepare the breadcrumb topping by combing all ingredients in a medium mixing bowl and stirring until fully incorporated. Sprinkle the breadcrumb topping evenly over the mac and cheese. 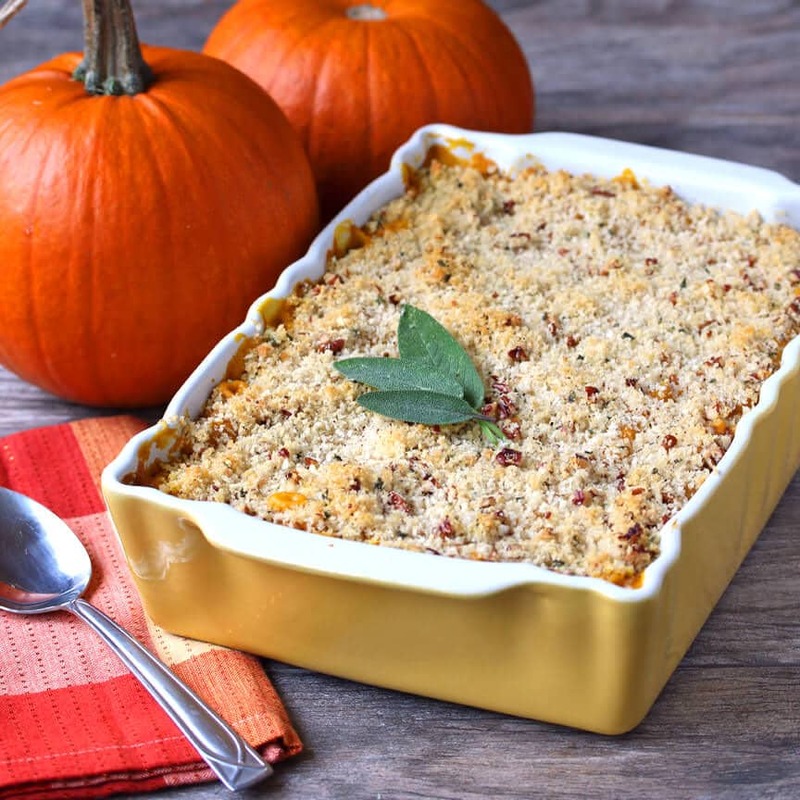 In an oven preheated to 350 degrees F, bake the Pumpkin Mac and Cheese for 30-35 minutes or until it’s bubbly and the breadcrumbs are golden brown. Remove from oven and let sit for 5 minutes before serving. 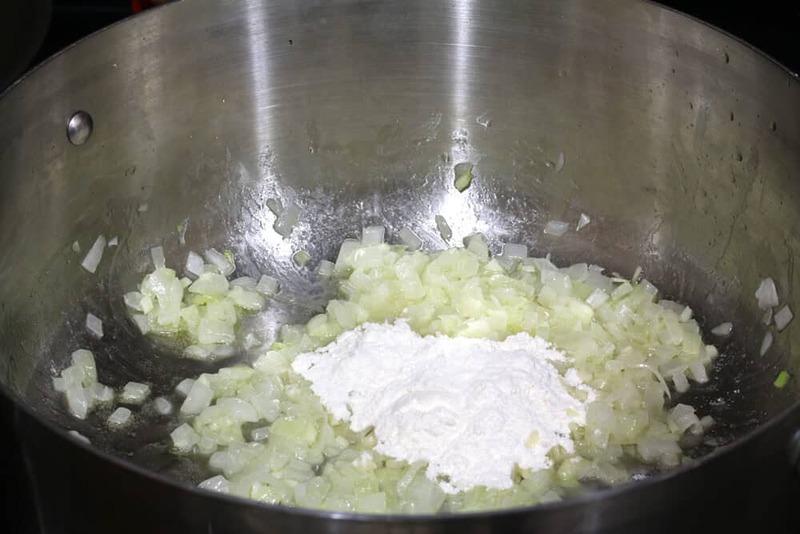 Melt the butter over medium-high heat in a large stock pot (large because we're stirring in the noodles later) and cook the onions until soft and translucent, 5-7 minutes. Add the garlic and cook for another minute. Sprinkle the breadcrumb topping evenly over the mac and cheese. 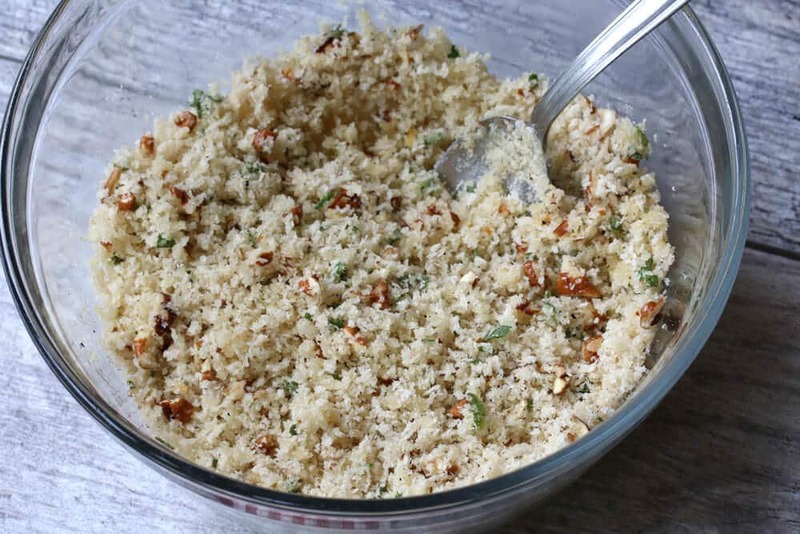 Bake for 30-35 minutes or until it's bubbly and the breadcrumbs are golden brown. Remove from oven and let sit for 5 minutes before serving. 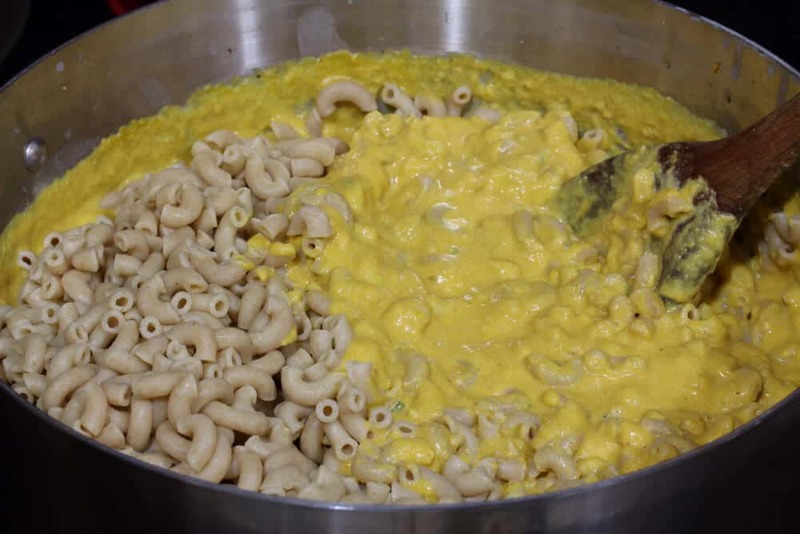 You know, I haven’t made pumpkin mac and cheese yet, although I’ve seen many recipes. This is the first one that really has me looking in the pantry for the ingredients. Yum! I love the addition of pecans and sage. This looks so delicious! This looks so amazing. 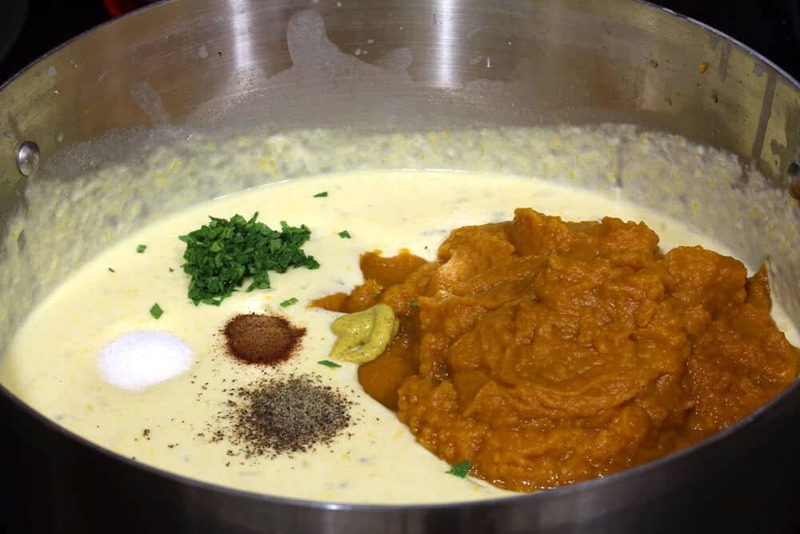 And it’s the same with my kids, they eat and like most anything I make with pumpkin as long as it is mashed so they do not recognize it as such. I tell them is carrots, if I mention the word pumpkin,they would not eat it anymore. So weird! OMG, this looks amazing! and so comforting and perfect for cold and rainy weather. Pumpkin and cheese go surprisingly well together, don’t they?! I think my kids would eat this too, I’m definitely going to have to give it a try! 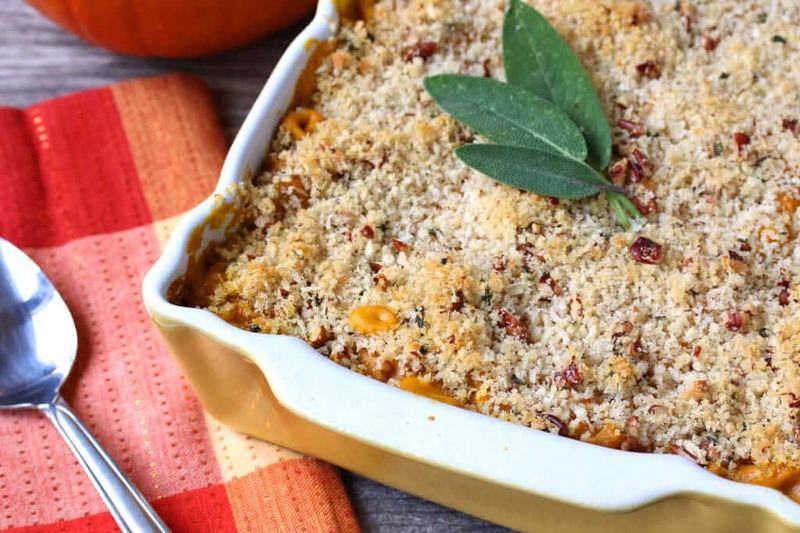 It looks like the perfect fall comfort food. you had me at gorgonzola and sage Can’t wait to throw this on my Thanksgiving table ! That’s so cool that you all carved pumpkins from your own harvest! :) And this looks fantastic. 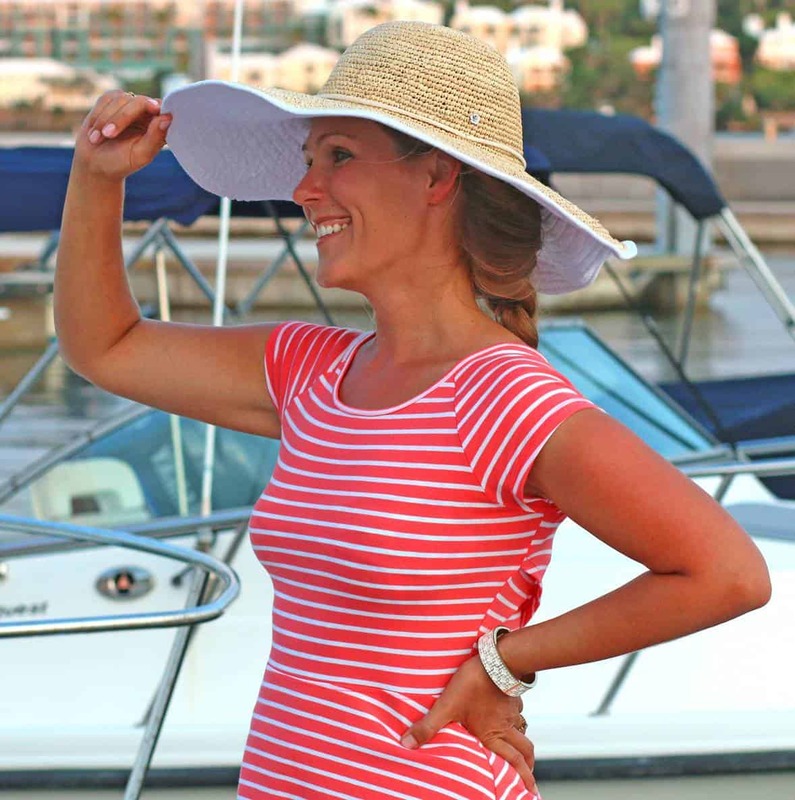 I love that you used whole wheat pasta! You are right…perfect comfort food! 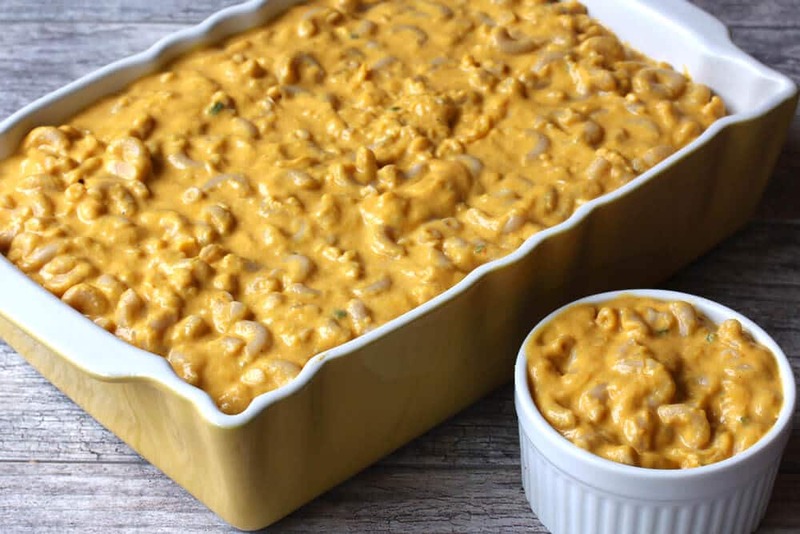 I haven’t tried a pumpkin mac and cheese….time to give it a try! Yours looks wonderfully yummy! That looks so incredibly creamy! 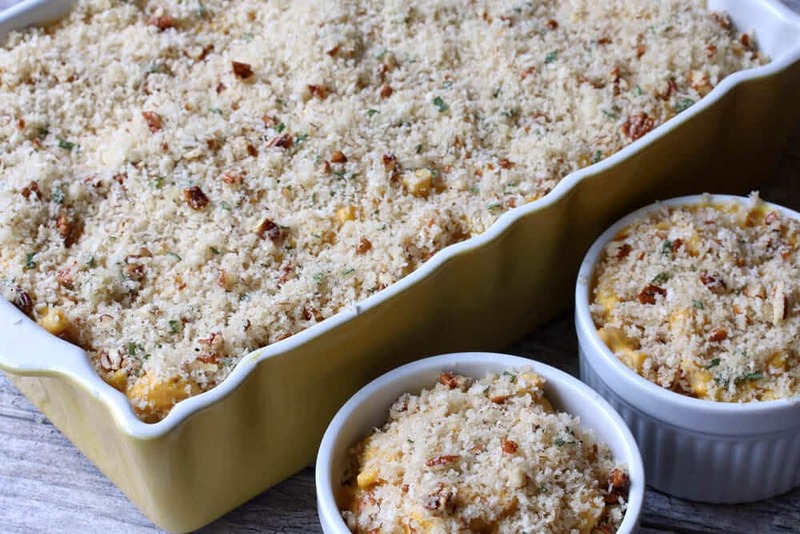 So true – homemade mac ‘n cheese is the ultimate in comfort food. I’m dying to try this version, that gorgonzola is screaming my name! We grew pumpkin when I was growing up, and I remember how exciting it was carve one of our own for Halloween! That is one gorgeous dish of mac ‘n cheese. I LOVE mac and cheese! Adding pumpkin to it makes it even more delicious! Pumpkin mac and cheese is so good! I make it a few times a year during fall and it’s always gone super fast. I love that you bake yours! How neat that you got to carve pumpkins from your own harvest! That’ll hopefully be us next year! And, holy smokes. 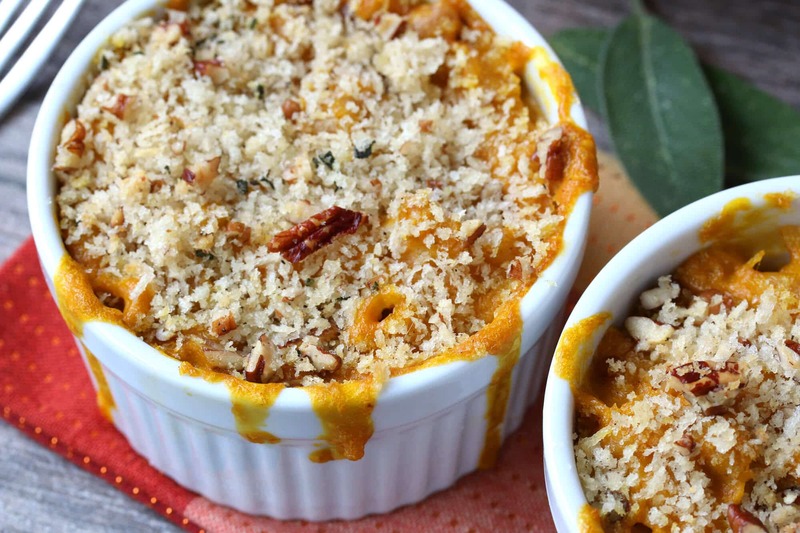 Pumpkin mac and cheese!! What a terrific recipe idea! I have never tried it but it just moved up to the top of my list! 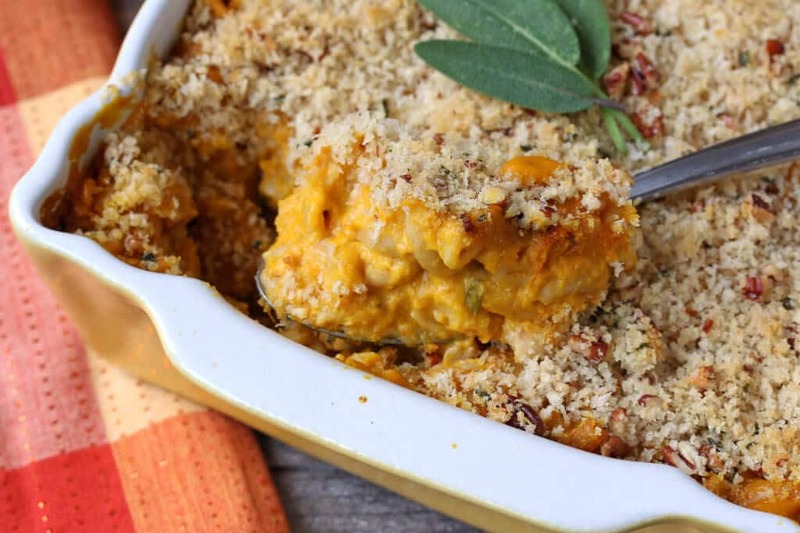 This might be the best looking seasonal mac and cheese I’ve seen this year. Love the pumpkin, love the topping! It’s after 3pm, I have yet to eat anything other than some hummus. Now I am dripping saliva across my keyboard.! This looks scrumptious, I LOVE the addition of pumpkin! I made this last night exactly as written and it was amazingly good and delicious. Only thing is that it makes a lot – more like for 12 people. Had to bake it in two large dishes. I gave one whole dish to my DIL and her family and they loved it also. Wonderful, Baiba, I’m so glad it was a hit! Yes, it does make a lot and I used my deep-dish 9×13 casserole pan. So glad the rest of your family enjoyed it too and I really appreciate the feedback, thank you!